Do you like showing off your subwoofer? There are a number of DVDs that do the job fairly well, but my favourite is the otherwise forgettable Titan A.E.Fox animated movie. In particular, the first six minutes or so before the main title comes up. But will your subwoofer deliver all the bass on this DVD as spaceships are taking off, the Earth explodes, and the Moon is impacted by a huge chunk of it? I’d say that the chances are 99:1 that it won’t. But most subwoofers, despite the name, will not produce much significant output below 30 hertz. 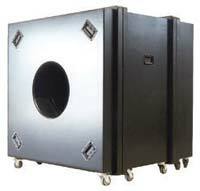 The so-called subwoofers with a lot of inexpensive surround systems will rarely go much below 40 hertz. Strong output at 20 hertz? Expect to spend well over $AUS2,000. Fifteen hertz? Double that amount of money! I use a Paradigm Servo 15 (~$AUS4,000) (see this review and this one and this one). This is very strong down to around 16 hertz, and it produces not just audible rumbling, but on this section of the movie seems to make the air of the room pulsate with energy. Quite an experience! But what I’d really like to do is to is repeat the experience with a Whise Profunder 319A sub. Or even better, a Whise Profunder 616 passive sub, with suitable amplification. Fortunately the concrete is around 600mm thick under that corner of the room (the 616, sans-amplification, weighs 230kg)!